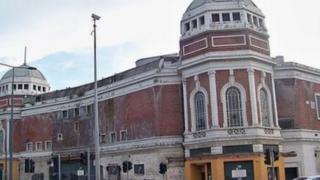 The owner of Bradford's former Odeon cinema has offered to sell it to the city council for £1. The offer by the Homes and Community Agency (HCA) comes after plans to demolish the building and build offices and apartments were scrapped. Langtree Artisan had wanted to redevelop the site but the HCA said an agreement was terminated because developers had not complied with terms. Council leader David Green said the authority was considering the offer. The Odeon was bought by regional development agency Yorkshire Forward in 2003, which later entered into the development agreement with Langtree Artisan. The building was then transferred to the HCA when the government decided to abolish Yorkshire Forward. Following the decision to terminate the agreement with developers, the HCA and council are now discussing the future of the building. Naz Parkar, from the HCA, said: "We recently made an offer to the council to purchase the site for the nominal value of £1. "Following the transfer of the building, we would support the council to secure a commercially viable outcome for the site that meets their objectives and those of the people of Bradford. "We will continue to work closely with the council to resolve the future of the former Odeon and deliver their ambitions for the city centre." Mr Green said: "Before we make any decision we've got to carry out proper due diligence to make sure we're in a position where we are taking on an opportunity rather than a liability. "We are talking to the HCA and carrying out our own processes and procedures. Once we have all the information we will make a decision." The building was opened in 1930 as the New Victoria, a cinema and theatre, and closed in 2000. Its landmark facade has been left virtually untouched.